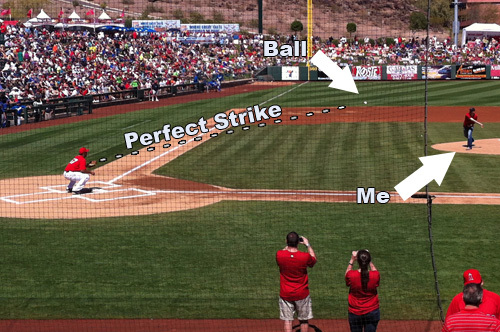 Some of you might remember that a few months back, Black and Decker had me out for a media event in Phoenix, Arizona, and it was at that event that I had the huge privilege of throwing out the first pitch at a pre-season game between the Angles and the Royals. It was awesome! The purpose of the trip was to discuss B&D’s new line of 36v cordless lawn tools. The lineup looked great, and we got to try out the string trimmer, lawn mower, hedge trimmer and sweeper/vac. Everything worked well during the demonstrations, and maybe that was because we were testing them out on perfectly groomed stadium grass! You can imagine that I still had doubts, and the big question for me was runtime. How long did these 36v batteries last? Well the folks at B&D sent me a few products, and I’ve been using them for weeks on my own lawn (which doesn’t resemble stadium grass at all). Here’s how the 36v line fared. 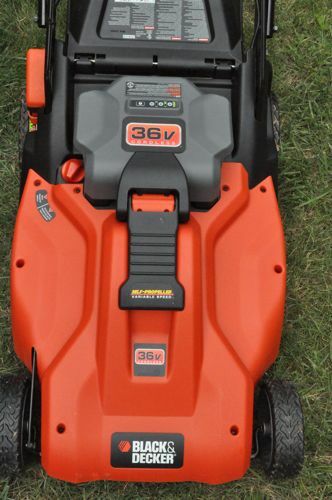 First, let’s take a look at the 36v lawn mower. 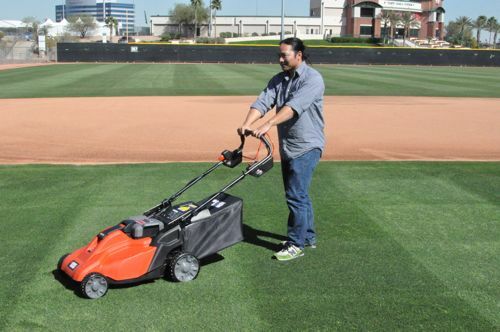 This is a 19″ self-propelled mower with variable speed. It’s got a removable 36 volt battery that resembles a car battery more than anything else, and B&D claims it can handle about 1/3 of an acre on a full charge. Instant Start – To start the mower, you push in a button and engage a lever! Forget priming the engine and yanking on a pull cord. There is a safety key much like you find on a table saw, and that needs to be in place before it’ll start. 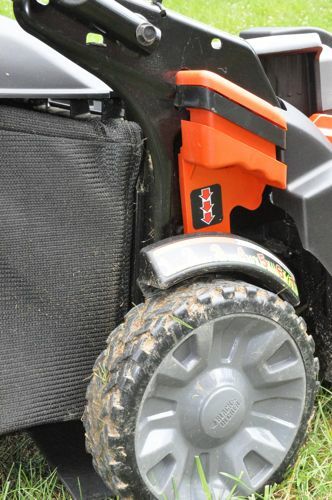 Height Adjustment – I never change the blade height on my mower. Even so, this quick adjust makes it simple to set the height for all four wheels at the same time. 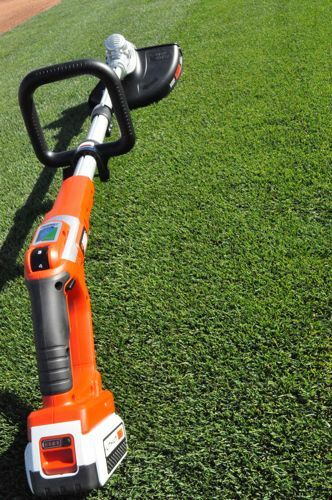 Self-propelled – A friend likes to get his “exercise” by using a push mower. That’s not for me, and I like the variable speed, self-propelled feature. It does struggle a little bit going up my hill though. Plastic Deck – Normally plastic in lieu of metal isn’t a good thing. However, my gas mower deck is rusted so I’m glad B&D opted for the “lightweight high impact polymer deck”. Removable Battery – Not all battery-powered mowers have a removable battery and that’s a problem because not everybody has a shed with power. With the SPCM1936, you can charge the battery in the mower or separately. The features I listed above don’t matter if the mower doesn’t cut grass or if the battery doesn’t last. B&D states that this battery is good for 1/3 of an acre (~14,000 sq. ft.), and that number assumes average grass height and a relatively flat grade. My yard is a measly 2,000 sq. ft. with about half of it on a significant slope, and (as expected) the SPCM1936 can more than handle my yard on a single charge. That’s fortunate good because it takes 12 hours to fully charge the battery! Alternately, you can shell out an additional $129 to purchase a spare battery. It’s worth mentioning that B&D recommends leaving the battery connected to the charger when not in use, and it won’t harm the battery life. That’s how I store just about all my batteries. Another issue for battery vs. gas is the reduced power. The SPCM1936 will not muscle through knee-high grass like my Craftman gas mower. Again, not a deal-breaker because I mow my grass before it gets that high. One annoyance I found while using the mower is that the wheels can lock preventing you from pulling the mower backwards. This occurs when you disengage the self-propeller lever and immediately try to pull the mower back. It’s probably a safety feature, and the work around is to push the mower forward a little before reversing direction. 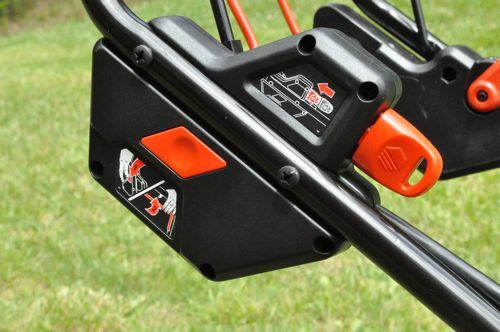 So with these features and level of performance, which users should really consider upgrading their mower? I’d suggest the SPCM1936 to anyone with a small to medium-sized yard (especially urban areas) that can be completed on a single charge. Nobody wants to wait 12 hours to finish mowing, and $129 is too much for a spare battery. Ladies in particular often struggle with pull strings, and, if that’s the case, you’ll really enjoy the instant start. Some areas have noise ordinances or emissions restrictions (like California), and this mower is the perfect answer. Lastly, if you hate storing gas, oil and fuel stabilizer or performing regular mower maintenance, than this mower is for you. 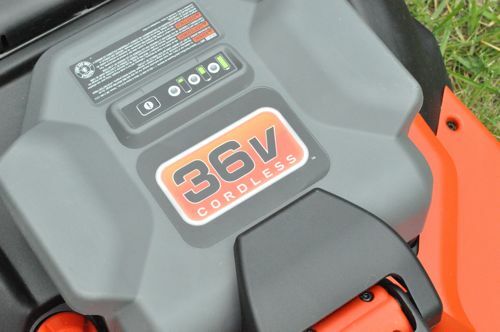 Almost exactly two years ago, I published a review of the Black & Deck 24v string trimmer, and my biggest problem was that the battery didn’t last long enough. Sometimes the battery didn’t last long enough to even finish my yard! Well the new 36v trimmer looks and feels very similar to the 24v model, and they both share a lot of the same features. The big difference for me is that the battery technology has improved, and I can trim my yard on less than a full charge. 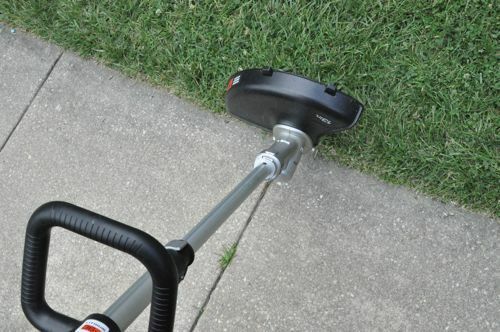 Autofeed Spool – I love the autofeed mechanism because I never have to stop or even bump the trimmer to let out additional line. Even though other users have reported problems, I’ve never had any issues, and this is a feature I really like. Edging – My second favorite feature is the rotating head which makes it super convenient for maintenance edging. Variable Power Setting – You can adjust the power to a lower setting which extends runtime. The things I liked about the old trimmer are still true for the new 36v model. The autofeed is great, and it’s easy to get going. Like the mower, there’s no need to worry about storing gas or gas-oil mix, and you don’t have to yank on a pull string. I’ve had the same pair of hedge trimmers for six years, and the biggest barrier to using them is actually running the extension cords out into the yard. For that reason, I usually cut the hedges once a season. 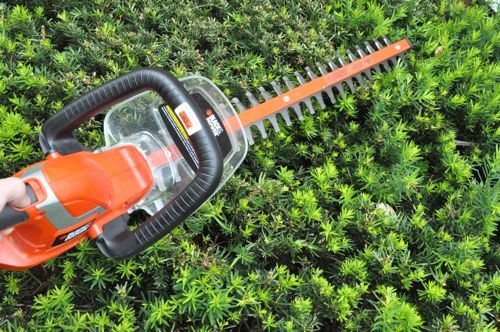 Now that I have B&D’s cordless LHT2436 hedge trimmers, I usually give my bushes a “shape up” almost every time I mow. The biggest thing these hedge trimmers have going for them is they are so convenient. 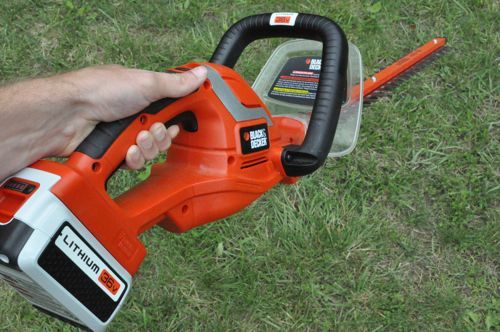 They feature a 24″ dual-action blade and can cut branches up to 3/4″ in diameter. They even work well to trim low-hanging tree branches. To operate, you need to engage a safety switch with your thumb. This is something I could do without, and my old trimmers have a lock-on button that I miss too. Altogether, I think B&D has some good options for homeowners with small(ish) yards. 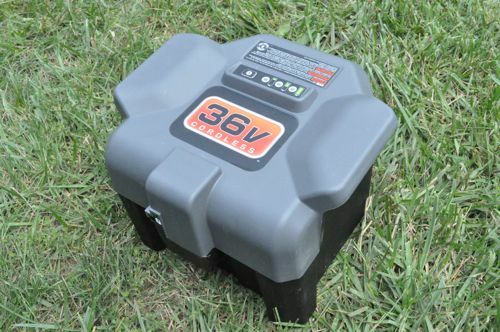 The 36v platform performs well, has decent runtime and is very convenient. I especially like the lawn mower and foresee a lot of homeowners jumping on that bandwagon. The current Li-ion batteries are 1.3 amp/hour, and I expect that’ll increase within a couple of years. B&D is also looking into brushless motors and whether they are a good fit for the lawn and garden category. These all look great and easy to use for the ladies or elderly people. Thanks for sharing! Thanks Jeanine. I think your right, and B&D really hit the mark for those demographics. Thanks for the review on the string trimmer. I really want to replace my corded model with a cordless one but between the cost and concerns about performance I still haven’t pulled the trigger. At least now I know this one works well. I like that edging feature something I would use right away as its never been done here. 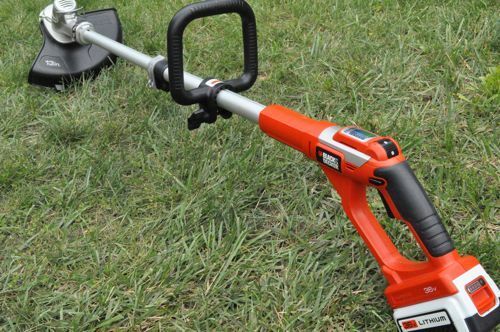 Do you find the string trimmer and hedger trimmer to be heavy with the battery weight? How about your wife? I know males never complain much about that but is it exceptionally heavier vs a gas trimmer? Also how long does it take to charge the battery? Along with the weight I’d be curious about the balance. I know they put the battery up at the handle and the motor down in the trimmer head so I think it would be almost perfect. That’s one of the things I enjoy about my gas trimmer is that it is perfectly balanced where the harness hooks up. Except for the mower, all the tools include a 1 hr charger. I’ll get back to you in the weight and balance. I wonder how much energy you end up paying for having to leave the batteries on the charger to prolong their life? I’m sure they have a trickle charge feature, but even so I would think it could eat into your utility bill. There are watt meters out there. I think the most widely available one is called the Kill A Watt. The meter measures how much power a device uses. Including the low draw standby power used by things like TVs and the trickle charge to keep batteries topped up. 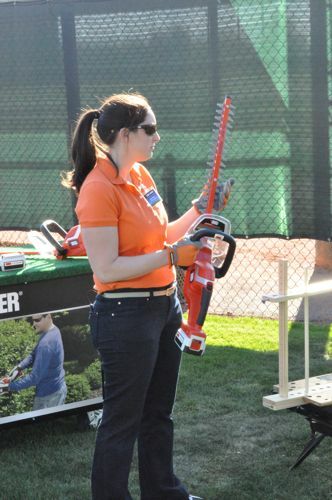 great article… I have a corded b&d hedge trimmer and can tell you I hate that safety. I’d have to see what the new safety is like before I made the call on going cordless, at this point I’d almost rather lose a thumb than deal with that safety. Thanks for the info! My sister has the older 18V version of the edger/weedwhacker (yes I know it’s like kleenex the brand name has become synonymous with the product). She’s been really happy with it and my mom uses it pretty regularly as well (she’s in her late 60’s and often has problems lifting heavy things and so this bodes well). I also have a couple neighbors who have the B&D corded electric edger and they’ve been pretty happy. I’m usually kind of a snob about tools but these seem to be holding up fine to regular use and do the job (albeit small jobs with the 18v edger). Isn’t it amazing how many items that where once tethered to cords now have battery versions available. When do the lawnbots arrive? I don’t think consumers will be pleased that the trimmer doesn’t have the capability of locking the trigger. There might also be some tension between parent and child when one forgets to recharge the battery after mowing. The extra battery might be worth it to keep the family together. I have a friend who has the 24v Black & Decker string trimmer and he can only get about half of his yard done before charging the battery. 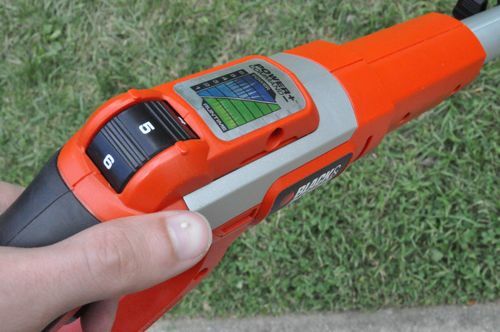 In fact, when he is going to have people over and needs to cut his lawn quickly he borrows my gas trimmer! This has prevented me from making the leap to the cordless electric, but I’m thinking that the 36v might be the difference maker for me. That would be a deal-breaker for me, especially for the mower because I have multiple batteries for the trimmer and hedge trimmer. I think battery technology is getting better, and right now cordless lawn & garden products can definitely handle smaller (1/3 acre) yards. 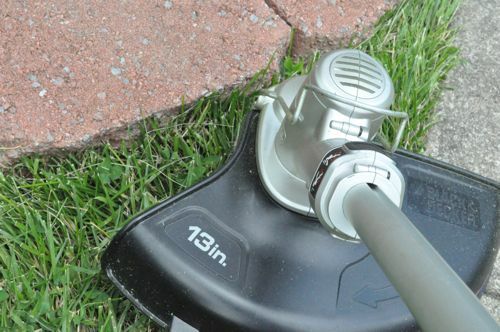 I have a really small yard since I live in the city and have always thought that going cordless (and getting some sort of trimmer) would be the key….. and your article is convincing me of this even more…. Although I am curious to know whether or not the battery makes the trimmer in particular feel less balanced when you use it…? B&D did a good job keeping it all balanced with the battery installed. If you’ve got a Home Depot nearby, you should be able to pick one up and feel for yourself.